Richtek Technology provides wide input voltage range linear regulator and DC/DC converter products to meet the request of high-performance power systems for Industrial, automotive and telecommunication applications. The design challenges of these applications due to harsh operating environments and large voltage transients are higher (12V to 48V) in automotive power management. The telecom applications typically run from a 48V supply that may extend as higher as 72V instantaneously. For low power operation, the supply circuits consume on a few milliamps current from high voltage input rails to keep alive. Richtek wide input range linear regulator is an ideal solution with operating voltages of up to 80V. The wide Vin linear regulators need not input protection components and reduce bills of materials cost and size as well as providing robustness to increase system reliability. 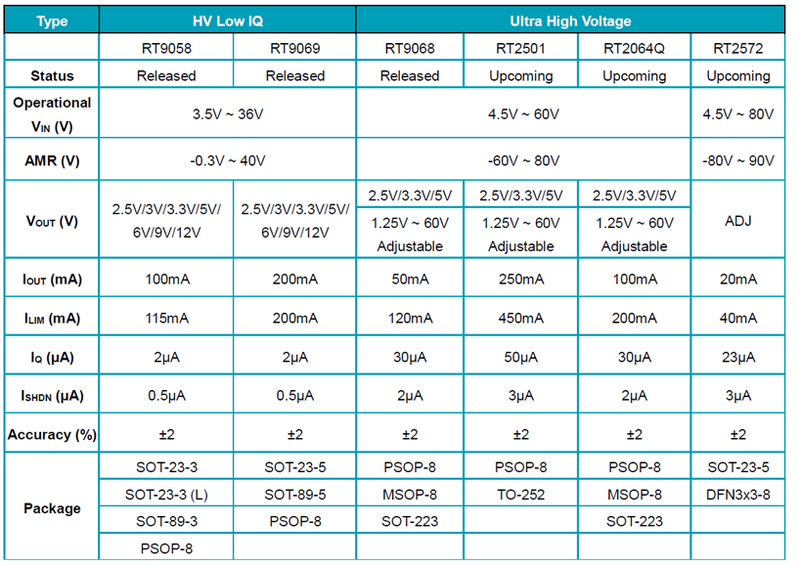 In the following discussion, Richtek wide Vin LDOs provide distinguishing features such robustness against input transients, high-power density which eliminates two-stage conversions, and low noise with good PSRR performance. The RT9068 is a high voltage and low dropout linear regulator in a thermally enhanced SOP-8 package. It can provide up to 50mA of output current from input supplies ranging from 3V to 60V. At 50mA of output current, dropout voltage on the RT9068 is only 300mV. The RT9068 operates normally on only 30μA of quiescent current. It can also be put into a low power shutdown state by pulling the SHDN pin low, bringing quiescent current down to just 1μA. For standard operation, the SHDN pin can be pulled as high as 60V. The RT9068 offered adjustable, fixed 3.3 and fixed 5V output versions. The only external components required are input and output bypass capacitors with minimum of 1μF for stability, Small ceramic capacitors with low ESR can be used without requiring extra series resistance as is sometimes required with other regulators. In order to manage complex electronics systems in car applications, automotive MCUs have featured one or more processors and several of the following blocks: SRAM, flash, oscillators, PLL, AD converter, I/O (CAN, LIN, Ethernet, USB, etc.) and power management. In automotive applications of new systems would be supplied from 12V to 42V, but both can have transients greater than 60V. At the same time, flexible and simple board design are paramount to reduce development costs and risks. In automotive MCU’s an internal voltage regulator was implemented in order to supply internal IP blocks that required a stable 3.3V supply. The limitations on power dissipation allowed the internal regulator to provide a maximum current of about 60mA. This current would be sufficient to power flash, oscillators, and PLL. The RT9068 family maximum input voltage of 60V makes it ideal for use in automotive applications where high-voltage transient spikes from 25V to 60V. Power connections to the RT9068 can come directly from a battery because input transients will not damage the regulator or the load. Even when batteries are reversely connected, RT9068 can prevent reverse current from damaging sensitive load circuits. 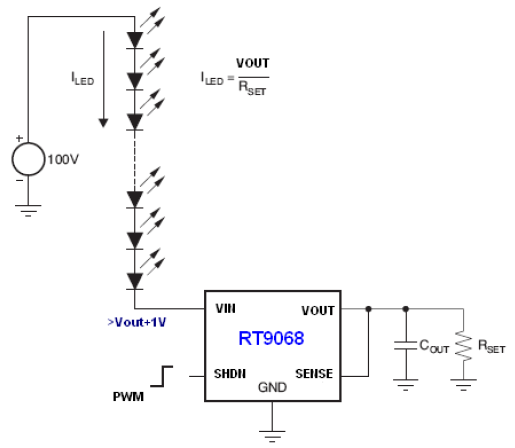 The RT9068 family can be used to suppress spikes with simple circuit which costs lower. 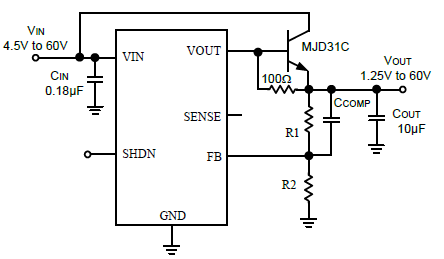 This MCU is often an always-on circuit runs for many modern automotive subsystems. The total current consumed by all always-on sub-MCU must be below several milliamps. The RT9068 can also be put into the shutdown state if the sub MCU is not needed. The battery pack with several cells connected in series may have transient voltages up to 55V in industrial application. These battery packs has internal circuitry designed to prevent overcurrent and overvoltage conditions that may damage the microcontroller. Meanwhile, the microcontroller continuously monitors the battery itself and may degrade battery life. 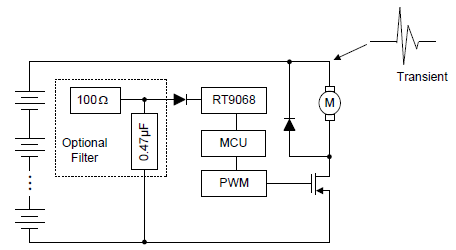 The best approach to power this microcontroller is to regulate down the voltage from the multi-cells battery; RT9068 is the ideal regulator for this application for very high voltages supply and very low quiescent current to maximize battery life. In high-power applications for motor, a MCU controls the motor powered by batteries. This MCU must be powered with a low-voltage rail coming from the high-voltage in multi-cell battery pack. In addition, this MCU must be protected from the high-voltage transients because of the motor inductance. The RT9068 is an ideal solution for powering the motor-controlled MCU with low quiescent current and very high-voltage capabilities with low system cost. In telecom application where 48V rail powers a keep-alive circuit for monitoring, the quiescent current specification is important, especially when battery back-up kicks in to keep the output alive when a fault occurs on the input. The 48V input rail in telecom applications can have transient voltages as high as 72V. In Industrial applications, the long wire with high voltage power line would cause the transient voltage spikes spans even wider and reverse input (-60V to 0V) from output are also possible. The RT9068 provides an optimum solution for such harsh conditions when reverse voltage from output to input, RT9068 prevents current flow from the output back to the input, removing the need for protection diodes. Higher output currents and/or increased power dissipation are possible using an external NPN output transistor in adjustable-output version RT9068GFP. VOUT drives the base of the transistor and SENSE and/or FB monitors the actual output voltage as shown in Figure 5. The RT9068 can be used to drive several LED drivers connected in series, as shown in Figure 6. By control the PWM dimming signal at its SHDN pin, the array of serial led LED could have the intensity dimming behavior. 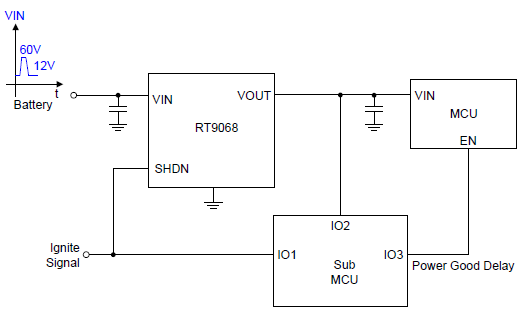 It is a simplified with low-cost for higher input voltage LED driver implemented by RT9068. The RT9068 offers exceptional performance in a small package. It can supply low power from high voltage rails in applications that previously required external pre-regulation schemes or complex switching supplies. Low quiescent current minimizes the power consumption and can be dropped even further by placing the part into shutdown state. Stable output voltage is available with a wide range of output capacitors including small ceramics. Internal protection circuitry in the RT9068 eliminates the need for external protection diodes. The thermally enhanced 8-lead MSOP package provides low thermal resistance and is suitable for using in harsh environments. In many applications including communications, automotive, and industrial systems, wide input voltages as high as 60V to 80V will convert to 24V/12V/5V or lower to supply electronic systems. In many 12V and 24V systems, transient approaches 80V are commonly occurred and need to be carefully considered. RT9068 provides the industry’s most comprehensive wide input voltage range to 60V and eliminates input protection components to reduce cost and solution size while increases system reliability. Additionally, a single device can operate across several voltage rails to provide scalability and allow reuse of power converter designs. Stefano Pietri,Chris Dao, Jehoda Refaeli, Alfredo Olmos, and Xiaolei Wu, “A Versatile Low-Dropout Voltage Regulator for Automotive Applications”, IEEE 2011. Ashok Bindra, “Selecting the Right Ultra-Low Quiescent-Current LDO Regulator “, Digi-Key Corporation Article Library, 2014.